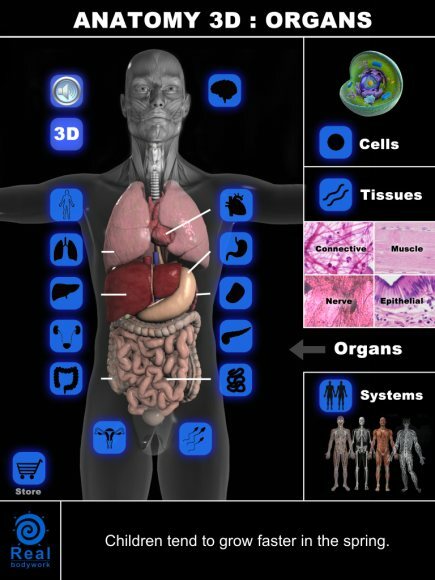 Most of the anatomical apps available in the app store today focus on gross musculoskeletal anatomy and the market is relatively limited for those which focus on other areas of the body such as the major internal organs. Anatomy 3D organs is one of a number of apps developed by Real Bodyworks. It contains information relating to the anatomy, structure, function and histology of each of the major internal organs of the body. 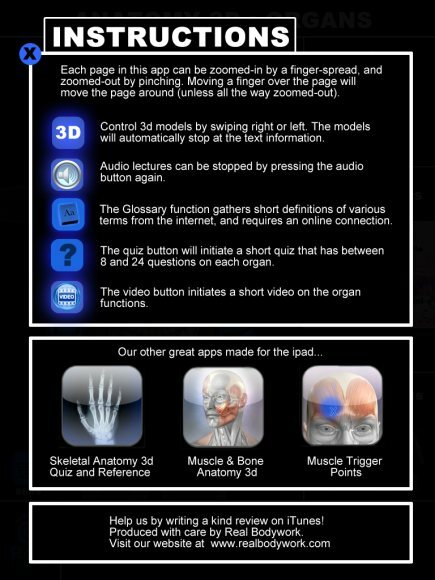 This review continues our series in which we examine a range of anatomy apps to find out which are the ‘best’. Opening the app presents the user with an instruction page leading to a ‘contents’ page. Here the user can easily access all the information contained within the app by clicking on a specific organ to examine in more detail. This leads to a one-page summary of the major anatomy, function, and histology. 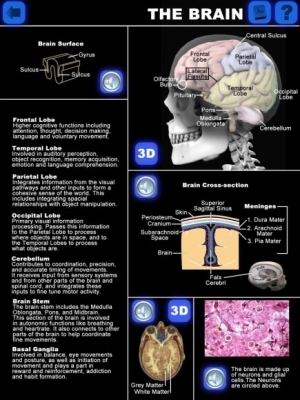 Each section is often supplemented with audio narration which explains the basic anatomy and function of the particular organ. This page can be zoomed in using touch gestures although it is not possible to open magnified versions of the images. 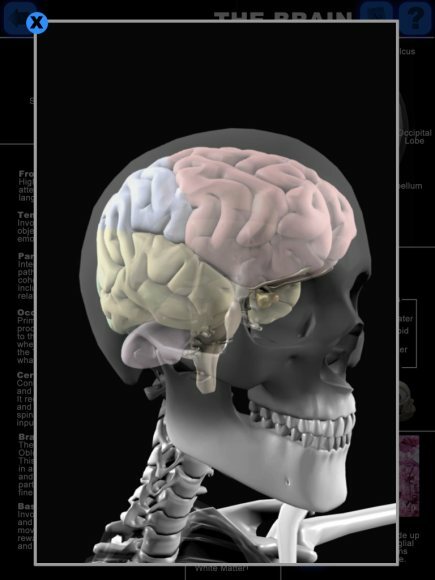 There is also the option to view the organ in a 3D model so it is possible to see where these organs are situated anatomically. 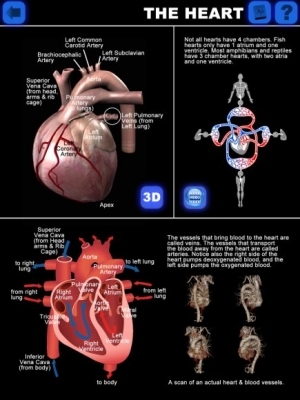 The 3D models are simple yet attractive and clearly illustrate the major anatomical points. 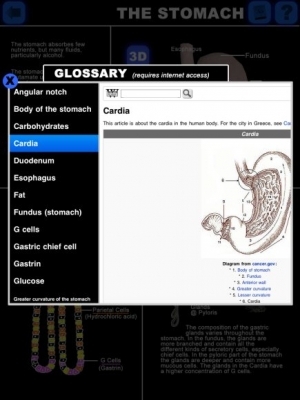 There are a number of other useful features such as an anatomy quiz function and a glossary function. This is particularly well implemented as selecting a term opens the relevant page on wikipedia. Whilst not always a reliable source of information, it is usually acceptable for basic ideas and understanding. 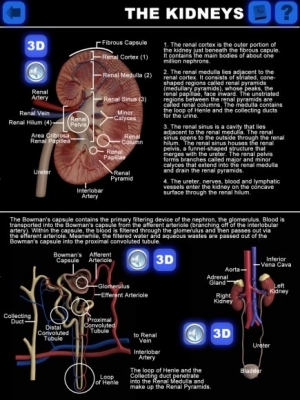 There are also audio narrations and short videos which explain the relevant anatomy and function of that particular organ. Whilst Anatomy 3D organs is attractive there are a number of major shortcomings which unfortunately restrict the utility of this app within a medical context. The primary one is the significant lack of detail. The actual anatomical detail contained within this app is minimal at best and covers only the major anatomical points. 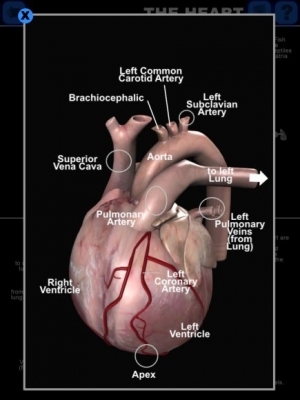 There is often critical omissions such as arterial/venous supply, innervation and clinical correlations. For example at no point was I able to find the Right Coronary Artery on the Heart model (the Left coronary artery was there but the Left Anterior Descending was not). 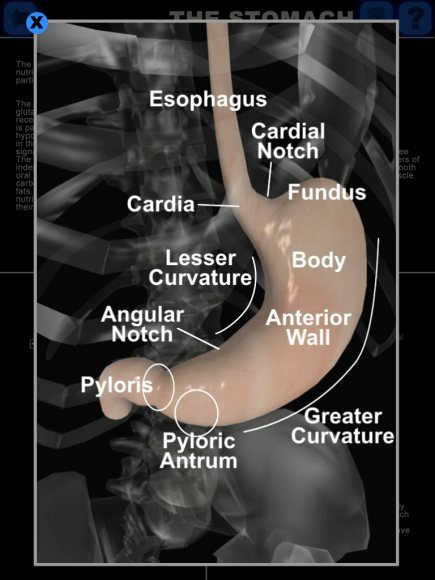 As such, this app cannot be recommended to healthcare professionals for anything other than the most basic introduction to the internal organs and their function. There may however — and it’s a stretch — be some use if this app was ‘prescribed’ to patients who were undergoing surgery and wanted a basic introduction to the anatomy and function of their organs.